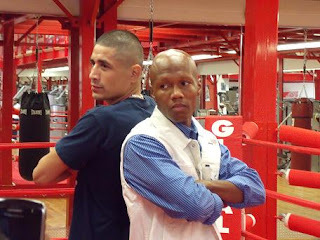 On July 16th at the Prudential Center in Newark, N.J., Zab "Super" Judah (38-6, 26 KO's) returns to face the durable Jose Armando Santa Cruz (28-4, 17 KO's) in a ten-round main event on ESPN2's "Friday Night Fights". Judah, 32, will be coming off a 9 month layoff when he steps into the ring Friday night, but appears extremely confident moving back down to the junior welterweight division, a weight class where he only lost one time. "I've taking a year off for Mayweather, a year off for Kostya Tszyu, and I've been off a year just relaxing," stated Judah. "I have a vision in the game that I want to finish up with, and I am going to finish as strong as I started." Judah is 5-4 with 1 no contest in his last ten bouts. However, he only moved up to welterweight for the money, and was always considered a natural junior welterweight. "My reason for going up to welterweight was Don King," declared Judah. "Don King said, 'You want to fight Cory Spinks?' I said yeah, yeah I want to do it. I could knock him out! When I won the title, there was no going back." Judah added, "In the fights with Cotto and Clottey, they were bigger and stronger than me. I wanted to go back to the weight class where I felt comfortable competing. A fight with Mayweather or Pacquiao would be the only reason to go back to 147 lbs." On the other hand, Santa Cruz, 29, is happy he does not have to make lightweight anymore. "Making 135 lbs. was too much for me and I felt drained," said Santa Cruz. "I feel very good now. After this fight, I plan on moving up to welterweight." Since suffering a 6th round knockout loss to Antonio Pitalua in 2008, Santa Cruz has won his last two bouts and attributes that to his father, Jose Santa Cruz Sr., being in his corner. "My dad gets more out of me," acknowledged Santa Cruz. "He puts more pressure on me than other trainers. He gets mad if I don't do things right." Santa Cruz believes Judah has really good speed, although he plans to smother Judah's punches and relentlessly attack his body. "When I put pressure I cannot be reckless," said Santa Cruz. "I must avoid his punches." 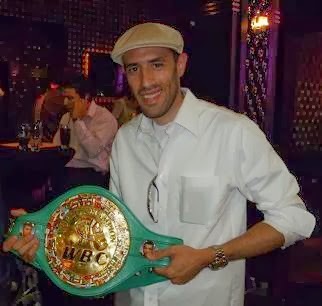 This will be Santa Cruz's first fight in New Jersey, however, he did battle Joel Casamayor in 2007 at nearby Madison Square Garden, losing a twelve round split decision. Casamayor, a southpaw like Judah, presents a similar challenge to the Mexican warrior. Santa Cruz believes he has a plan to stop him. 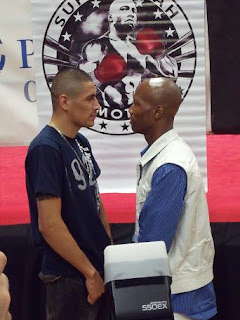 "Both Casamayor and Judah are fast, but I believe Judah is faster," declared Santa Cruz. "I may switch to southpaw against him. I am going to see what will work better during the early rounds. I will apply a lot of pressure to his body." Judah feels Santa Cruz is tough and is avoided by many fighters. "A lot of fighters don't want to fight him," said Judah. An impressive win for Judah could mean a possible fight in the near future against Timothy Bradley, Amir Khan or Devon Alexander. Yet, Judah is not in a rush and not looking past Santa Cruz. "For 3 1/2 months I had a picture of Santa Cruz in my gym," said Judah. "I'm focused on him." Judah did acknowledge that a fight against Alexander would be little harder to make than one with Bradley or Khan, because Alexander is promoted by Don King, who used to promote him. There are dates lined up in October and January at the Prudential Center for a possible title shot, which would air on HBO or Showtime. "How I feel after this fight will dictate what comes next," confirmed Judah. Judah added, "I've kayoed guys at 147 lbs. and 140 lbs. I bring excitement win, lose or draw." Undefeated welterweight prospect Alex Perez (11-0, 7 KO's) takes on tough veteran Edvan Dos Santos Barros (10-9-1, 7 KO's) in an 8 round bout. In other welterweight action, Sadam Ali (7-0, 3 KO's) puts his undefeated record on the line against Julias Edmonds (7-7, 0 KO's) in a 6 round bout. After suffering his 1st professional loss, Patrick Farrell (5-1, 3 KO's) will try to bounce back against Newton Kidd (7-7-1, 4 KO's) in a 6 round cruiserweight battle. In a lightweight bout, Nicky Demarco (2-2, 2 KO's) faces Jose Guzman (5-7-1, 0 KO's) in a rematch. Previously, Guzman won a four-round majority decision. Their rematch is also scheduled for 4 rounds. Light heavyweight Angel Concepcion (1-0, 0 KO's) will attempt to gain his second professional win against Shannon Anderson (4-1, 2 KO's) in a 4 round match-up. Heavyweight Adam Kownacki (3-0, 3 KO's) seeks his 4th professional win by knockout when he squares off against Damon Clement (0-2, 0 KO's) in a scheduled four-rounder.